Home > Archives > Santa Monica: Win Tickets to the CHAPLIN COMES ALIVE Film Series at the Aero Theatre, February 3–5, 2017! Flicker Alley is giving away FIVE pairs of tickets to the CHAPLIN COMES ALIVE film series at the Aero Theatre in Santa Monica, CA, courtesy of American Cinematheque! Enter using the giveaway form below for a chance to win! Giveaway ends February 1st at 9 a.m. PT! Friday, February 3, 2017, at 7:30 p.m.
Saturday, February 4, 2017, at 7:30 p.m.
Sunday, February 5, 2017, at 2 p.m.
Chaplin at Essanay, 85 min. Flicker Alley will be on hand at the February 5th screening, selling specially discounted Blu-ray/DVDs! Learn more about this film series and purchase tickets at AmericanCinemathequeCalendar.com. 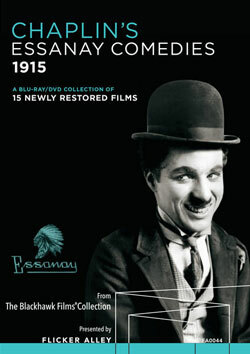 Chaplin’s Essanay Comedies Blu-ray/DVD box set available from Flicker Alley!